I was reading through my old blogs and came across one of my “seasonal” Race Calender updates and realized I hadn’t done one in a while, and my upcoming schedule is pretty much set in stone at this point. So here goes! For the second half of 2012. This race just happened to be in the right place at the right time. 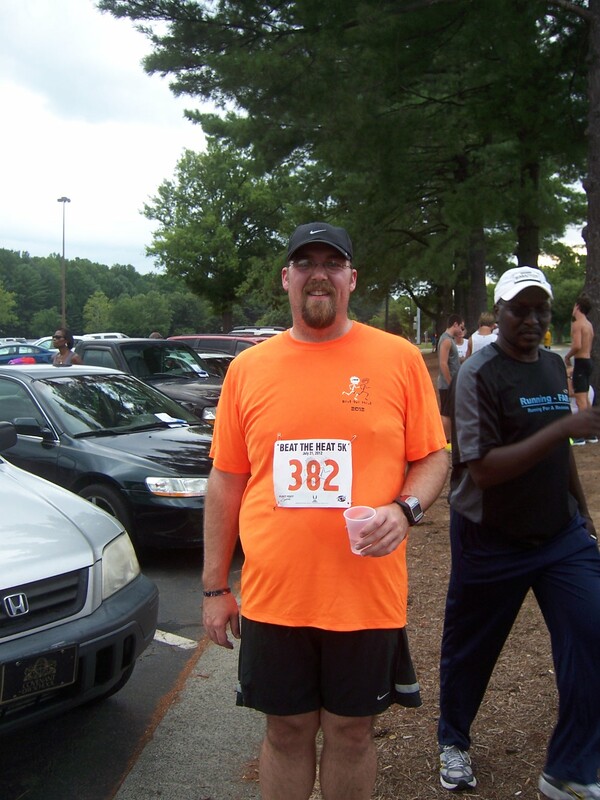 This race falls on my second weekend of half marathon training which calls for a 5 mile run. Well why not a 5 mile race? 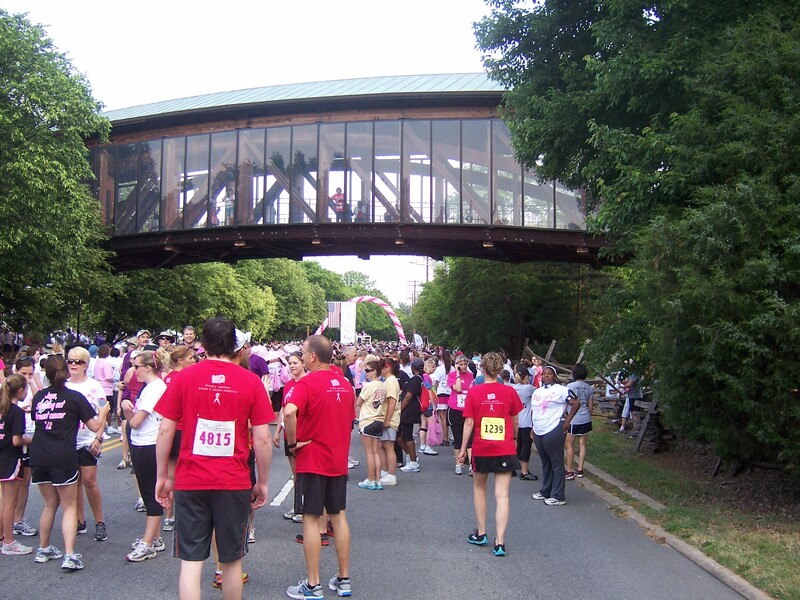 The race benefits a newly built greenway around downtown Greensboro. Since I’m planning on doing all my Raleigh long runs at Salem Lake anyway (for the hills) and this race is put out by my fellow TCTC buddies over at Ultimate Race Management this is a must do. It should be a great race. Obviously I’ll be doing the 10K and not the 30K (18 miles! WOW). I’m divided on this race. It’s rumored to be a flat and fast course, so I originally planned to set a 10K PR here, but since it’s 2 weeks before my half marathon and this is my half marathon “tune-up” I may have to hold back a little bit. I don’t want to burn myself out or risk injury so close to the big race. Although my 10K PR is right at a 12 minute mile pace, which now is my targeted half marathon pace, so if I’m slightly faster than that (for the shorter distance) I can set a PR without messing up my half marathon training. 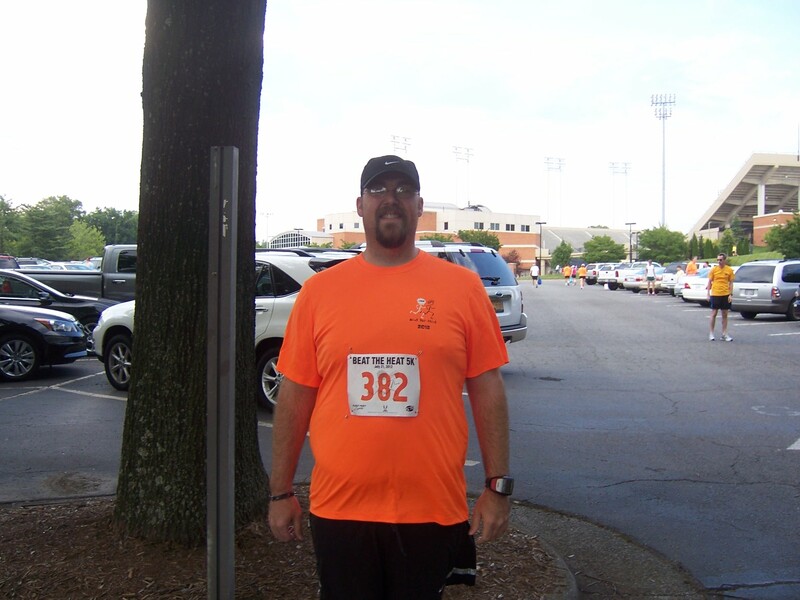 My second half marathon, this is a big race for several reasons. First, this race has a 14 minute/mile (3 hour) pace/time limit. If I want to have an “Official” finish at this race, I’ll have no choice to set a new PR and get under 3 hours, I think I can do this based on my current pacing and the pace I will attempt to train at. 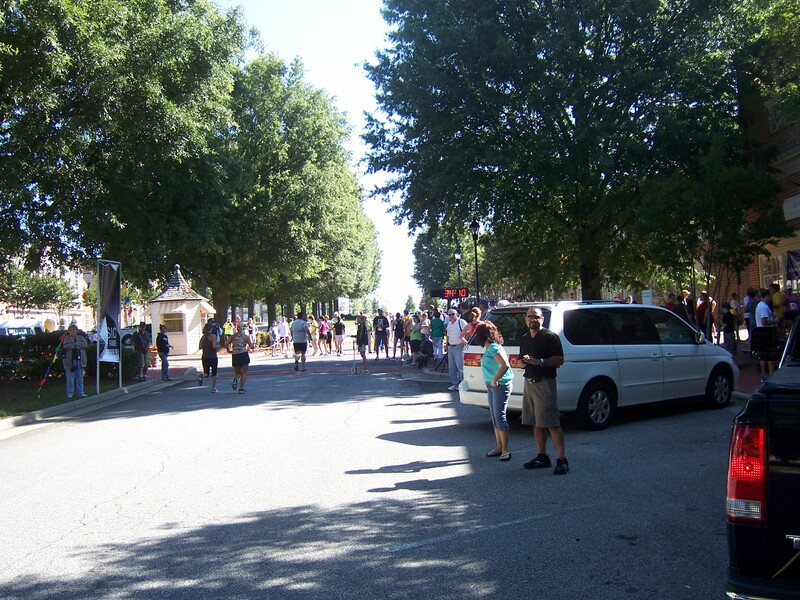 Second, I lived in Raleigh for about 10 years during my two tours of duty at NC State, I love Raleigh, and the race starts and finishes at the NC State Memorial Bell Tower, so this will be a awesome and sentimental race for me. I was trying to choose between Raleigh and Myrtle Beach and Raleigh won out. Last but certainly not least, my family will be there! My best friend Gray and his wife Katie (who may as well be family) will be there, and my sister and her bf as well as my parents are coming up for the weekend as well, so I will have a cheering squad and support crew with is very unusual for me, I’m used to running solo! Just recently got the email about this race from the Checkers (and 5 minutes later a forwarded version from my brother’s fiance) and it looks cool, and I also just discovered they are not running the Freisen 5K this year for the Hurricanes, so this will be my hockey race. The registration includes a ticket to the game that night, so run a race, go to a hockey game and hang out with my brother and his fiance? Win win win! I don’t know the exact date for this race yet, but this will be my December race, to make sure I run a race in each month of the year. Put on by the local YMCA and I assume it benefit’s them and their charities. 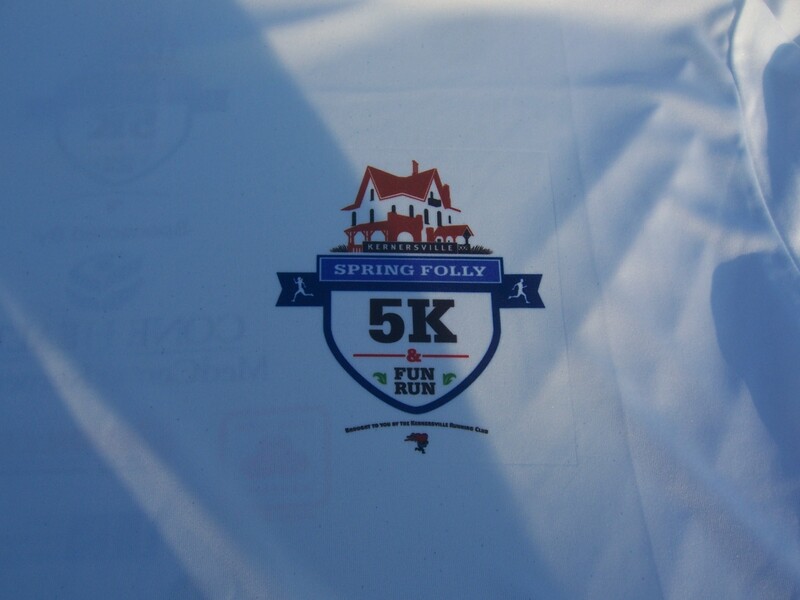 Hope to run this one with my buddy Jen if her hip is healed up. 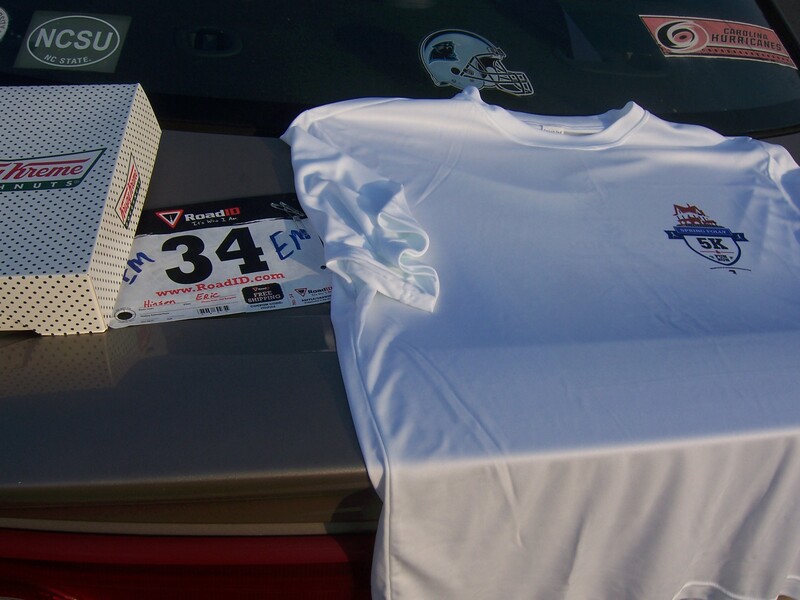 And that will finish up 2012 with 17 races including 10 5K’s, 2 8K’s, 3 10Ks and 2 Half Marathons. (85.8 racing miles). 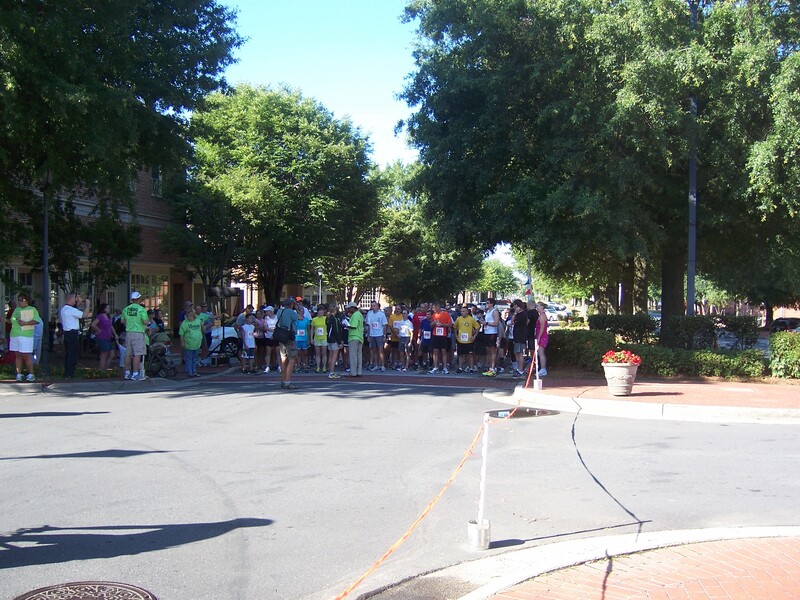 This morning was the inaugural Rhythm and Run 5K to benefit the North Carolina Music Hall of Fame in Kannapolis NC. I signed up for this race as soon as I found out about it since I was a little ashamed as such a music-phile that I didn’t even know this place existed. 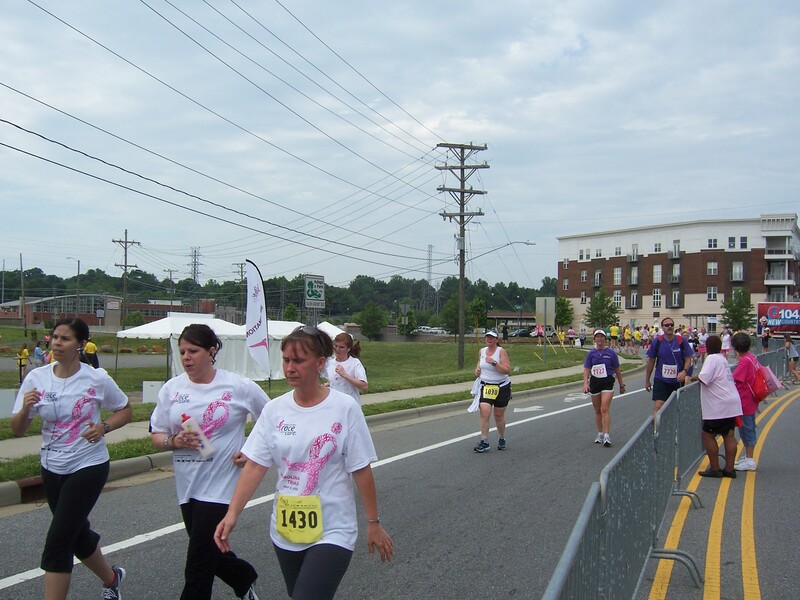 The purpose of this race was to promote them and raise awareness, and they surely succeeded. 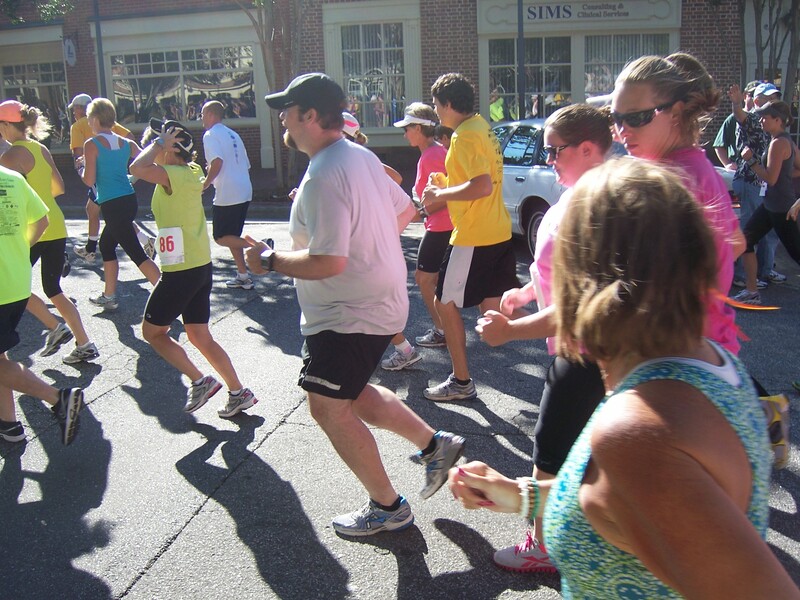 They had about twice as many register runners than they expected someone said over 200 instead of just 100. Unfortunately this did lead to one cardinal sin. They ran out of shirts. They told me they would have one for me next week, but I dont think I’m gonna drive down there just for a shirt. I have enough tech shirts, so was only slightly bummed. My parents were at this race today so that was very cool, as they were making a lightning tour of NC to come see us all, Charlotte on Friday, Kannapolis on Saturday and then Saturday night in Fuquay and then back home Sunday. Short trip but they wanted to come see us. 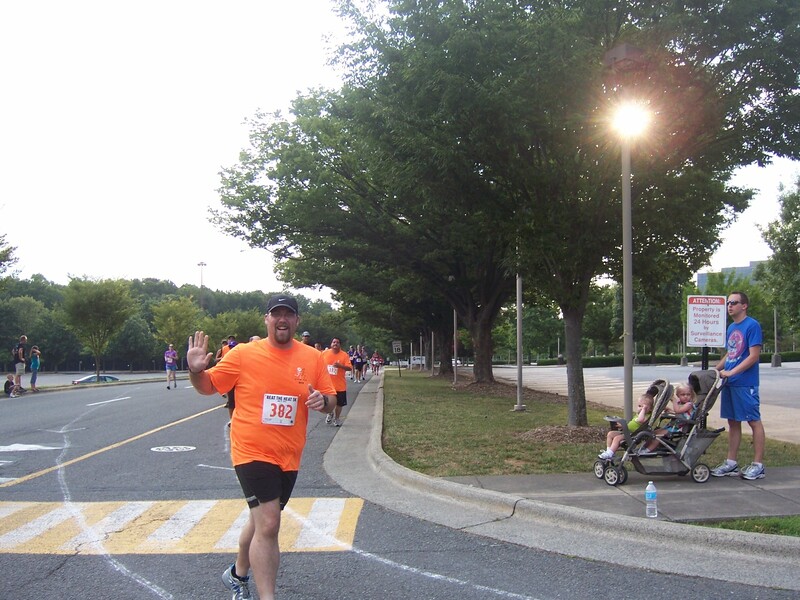 I told them it wasn’t worth it for a short race like a 5K (they are also coming up for the Raleigh Half in November) but they happened to be coming through this weekend regardless, so it worked out. 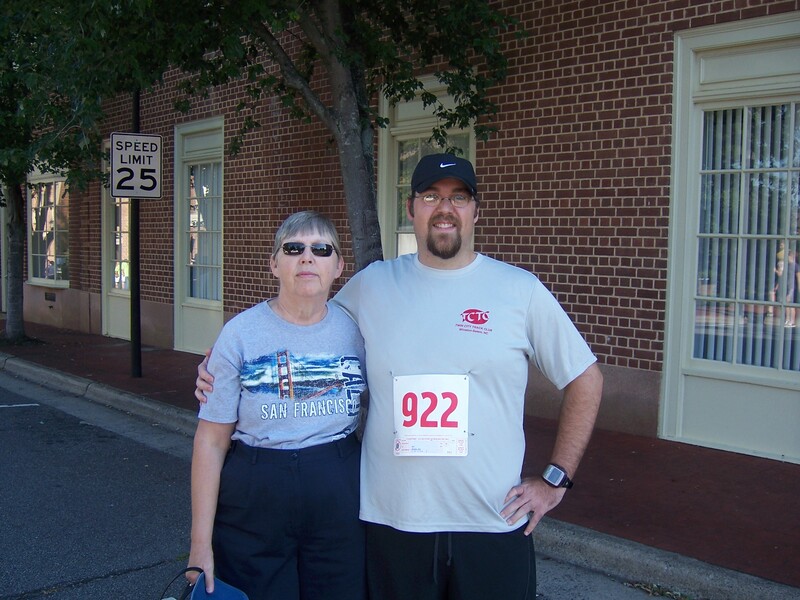 Me and Mom before the race. The race started promptly at 9AM, which I thought was actually a little late, I’m used to them starting around 7. 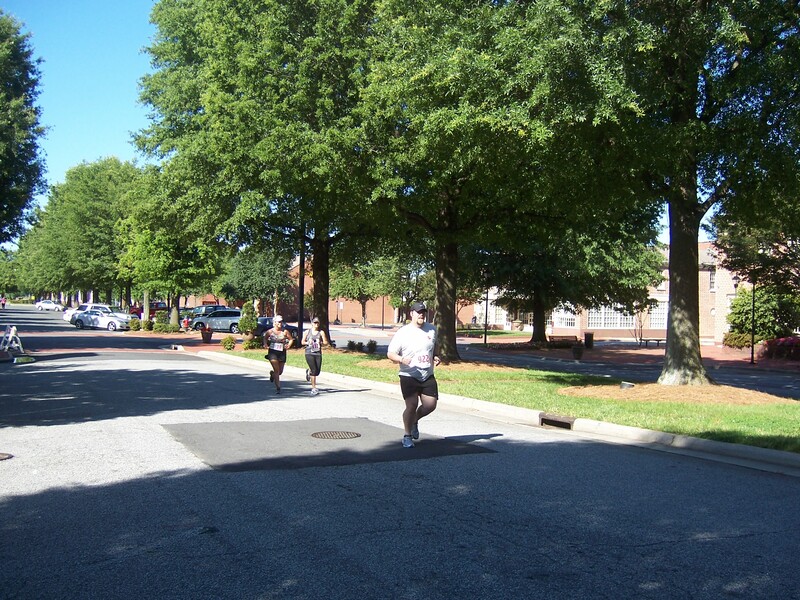 The first half of the course was shaded and breezy and then the second half of the course was hot and sunny. Dad caught me as I headed past him at the start. The course was an interesting course, we headed down the little downtown street onto the new North Carolina Research Campus, which is still only halfway built and then crossed a main road onto a greenway. We spent a good chunk of the race on this greenway, so that was nice, away from streets and traffic, although the greenway did cross a couple of major roads and there were some sidewalks/curbs/etc to contend with. After the greenway we headed into a small park and then wound through some neighborhoods before we headed back into down town. It wasn’t too hilly, but there were a few hills and I could feel myself bogging down in mile 3. I knew I was slowing down. It also got hot after the second mile as well. As we turned back onto West A Street I knew we were getting close to the finish, but I didn’t have the energy left for any kind of surge… just wanted to finish. I knew I was pushing close to a PR but I wasn’t sure if I was gonna make it or not. Ended up setting a new PR by 16 seconds. My mile splits were 10:08, 10:49 and 11:23, so as usual, started too fast and then faded, although 10:08 is also a 1 mile PR. Clock says 34:10, my watch said 34:02. 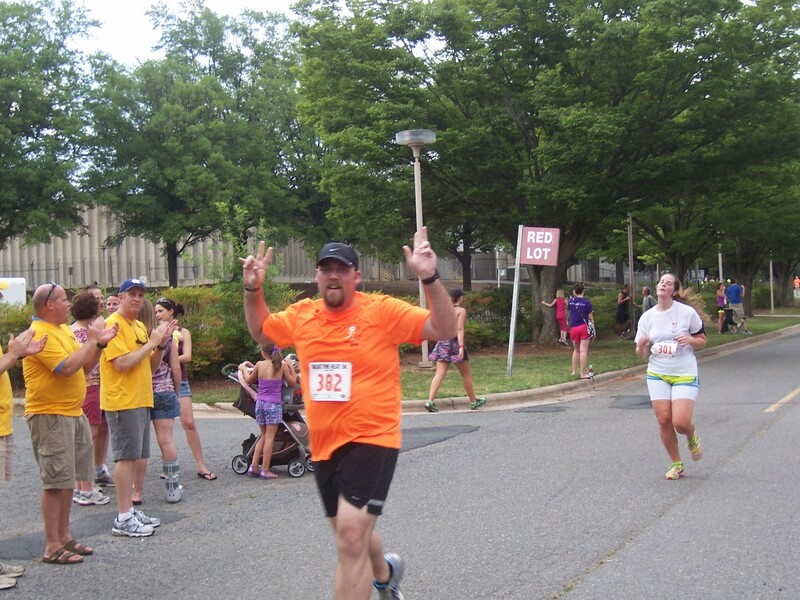 I think this may be a second or two after my finish since I appear to be walking. We’ll see what the official results say but I always go with my Garmin time anyway. After the race I changed clothes and we hung out for a while until they gave out the awards and found out that once again I did not place in my age group (not that I was surprised). Then we headed out to lunch. I had asked my Kannapolis connection Kathi (from the FFF 5K) to recommend a couple of BBQ places since my Mom had mentioned BBQ. One of the places she recommended was a place called Gary’s. 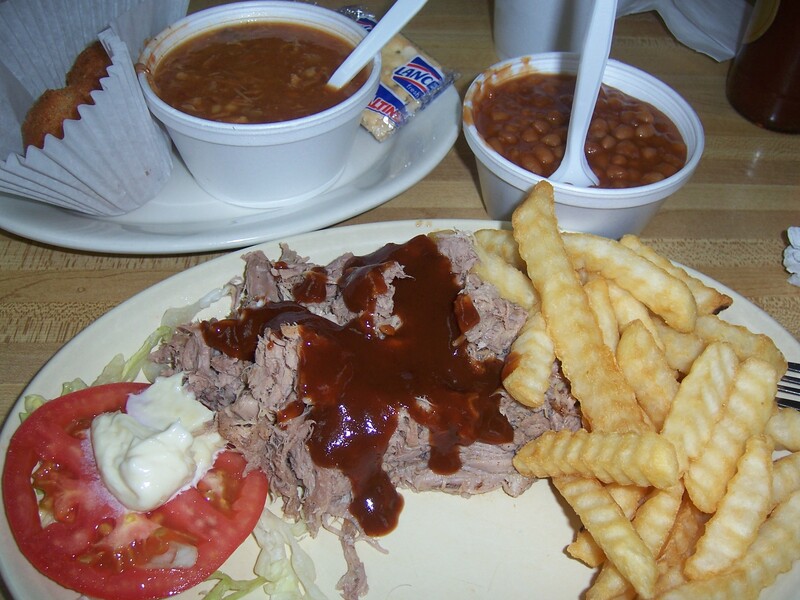 The reason I picked it was because she said it had good brunswick stew, although ironically enough, turned out it was an old haunt of my Dad’s back when he used to work that region a lot. 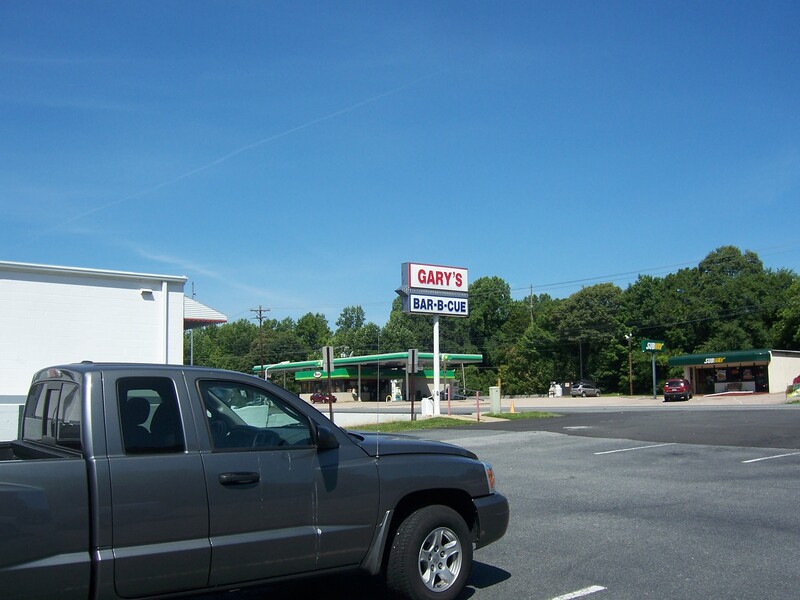 So if I had picked one of the other places, we likely would have ended up at Gary’s anyway! I didn’t take a picture of the inside, but the walls were plastered with every manner of old tin advertising signs you could imagine. Coke, Pepsi, 7-up, etc etc. There were a couple of old Ford T-Birds parked in a glassed in enclosure with a couple jukeboxes. Looked to be mid-50’s I would guess. Only glanced at them as we were leaving. The barbeque was OK, the hushpuppies were good and as advertised the brunswick stew was VERY good. I didn’t eat a lot of the beans, but they were good as well. I went for the Sweet and Smokey sauce (as did Mom), while Dad went for the Spicy Vinegar sauce. 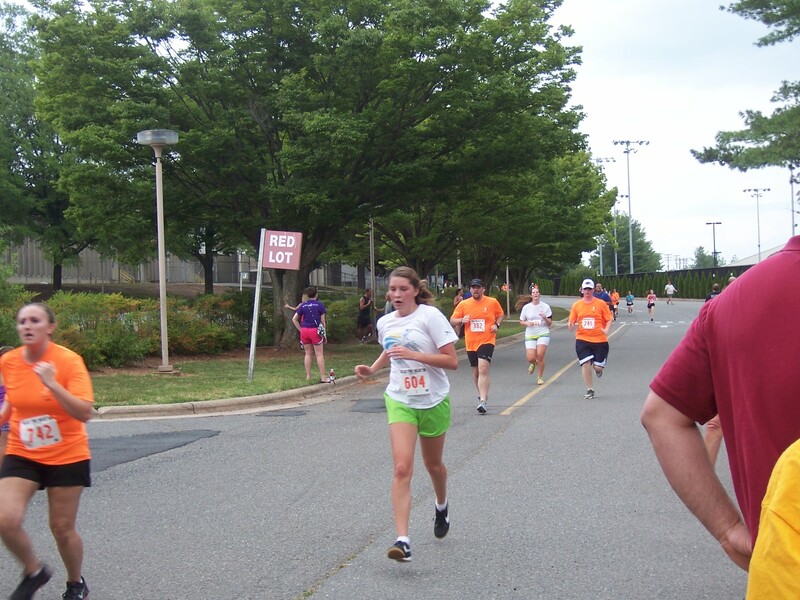 Surprisingly, I did not run this race. I was a spectator for once. Very interesting experience, since my first spectator experience got rained out. I was here to support my running buddy Jen, and also found out a few day’s before the race a bunch of my coworkers were going to be there as well. Since the purpose of the event is to raise awareness, I decided to take pictures and blog about it to help the cause. 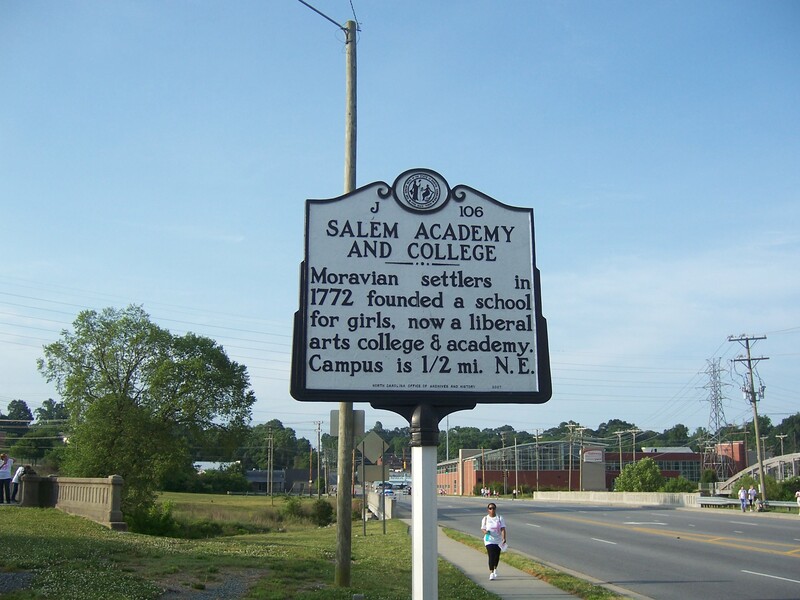 The event was hosted at Salem College, which is Jen’s alma mater and she also works at the school. 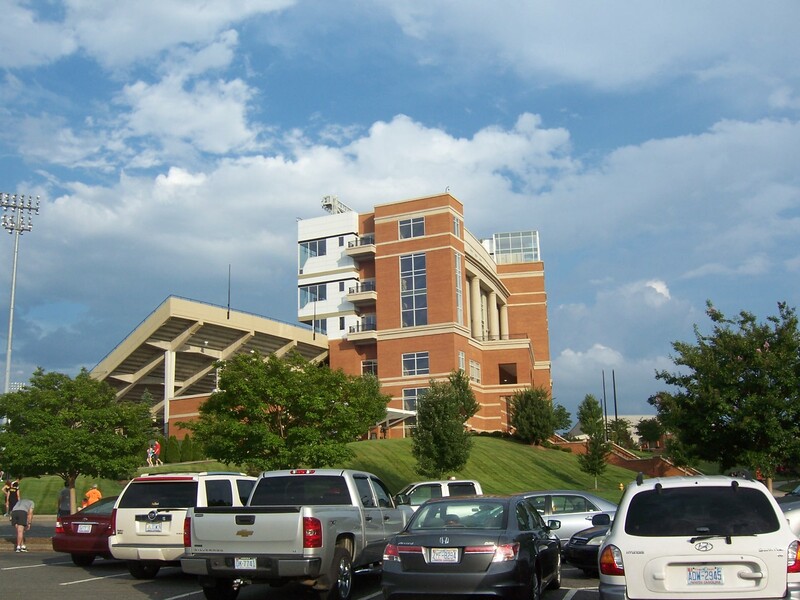 I didn’t see much of the campus, but what I did see looked nice. 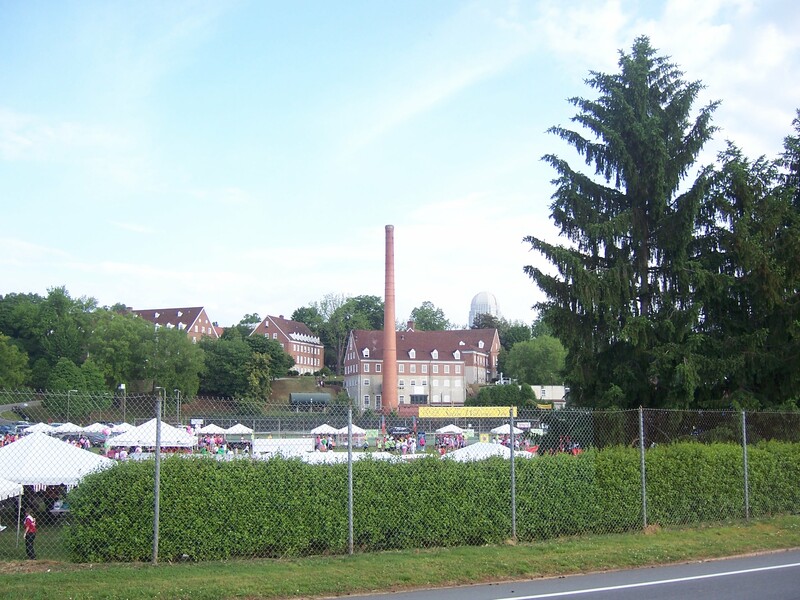 This building was behind the finish plaza.. I’m guessing a power plant with the smoke stack (and probably long defunct just like the one on NC State’s campus, but from an old coal fire boiler most likely). 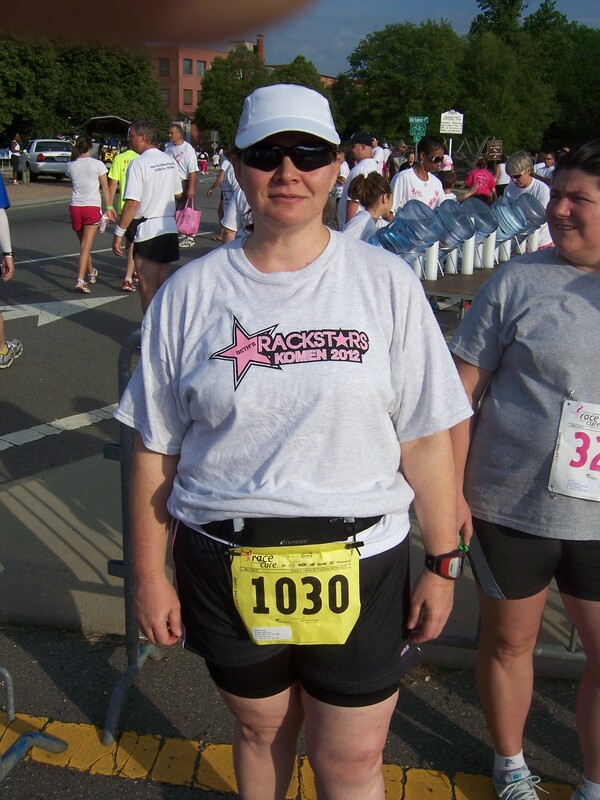 I met up with Jen before the race, she was on a team with a friend of hers who is a survivor and the team was named the Rack Stars.. play on Rock Stars.. there was another team called the Rack Pack.. so it was a popular euphemism. Smile Jen! How did I get my finger in there? 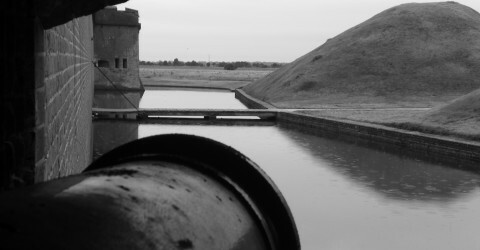 Some photoblogger I am huh? 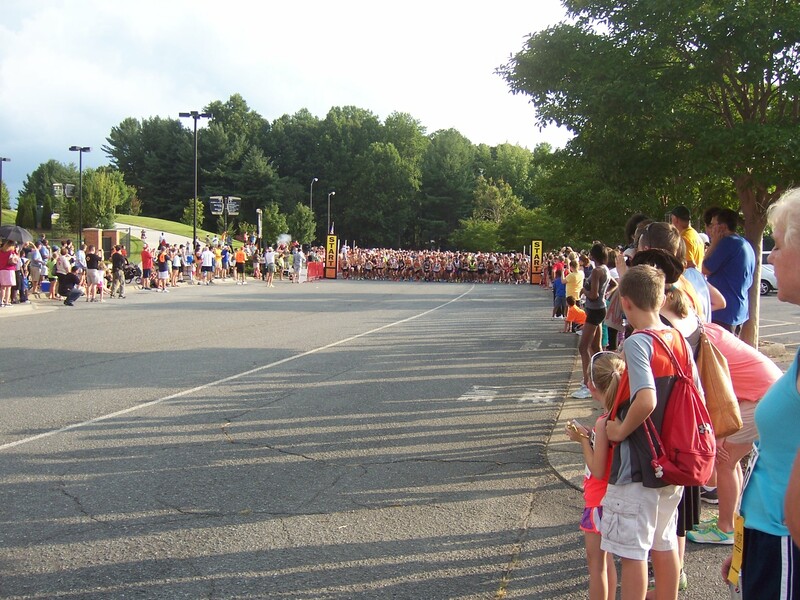 After that, I went to the finish area to look for my coworkers but I didn’t find them, so after a while I went back to the start line.. this is what it looked like as I walked up and more people were coming. Somehow I managed to find Jen in this mass of humanity and hung with her until the timed 5K started. Then as the non timed runners and walkers were making there way up to the start line I started looking for my coworkers, and I didn’t see them but then one of them found me, so I hung out with them for a while until the non timed race started. People were still filing through the start line 20 minutes after the start of course some of the walkers were taking their sweet time which is perfectly OK. I milled around the start line area for a little while since I had some time to kill and after 20 minutes or so headed back to the finish area. I posted myself at almost the 3 mile mark to wait for Jen and cheer on the other runners. I happened to catch the lead male as he was coming through and then a while later the lead female. Jen charging hard to the finish. I knew she was gonna post a good time, but by my watch it was about 45 minutes when she went by, but based on what they called out at mile 3, her official time was 43 something, and her Garmin time was just under 44 minutes. She was shooting for 45-46 minutes, so she not only beat her time goal for this race, but also set a new 5K personal best by several minutes! Yay Jen! It was funny watching the people close to the finish, I got to see some things I don’t ever see running a race. Some of the people looked like they were about to cry, some of them looked like they were about to die.. but they all kept pushing and I’m sure they all felt fine at the finish.. you don’t think about facial expressions when you are running that fast. All in all it was a great event for a great cause. There was an enormous crowd, even though the reports were attendance was way down, some of which having to do with the Susan G Komen/Planned Parenthood flap earlier this year. The course is reportedly well marked and well staffed, so that’s always nice. Although the water was down the hill at the finishers pavillion, not directly at the finish line, which was poor planning. I will probably definately run this race next year, but it was interesting to be a spectator for once. 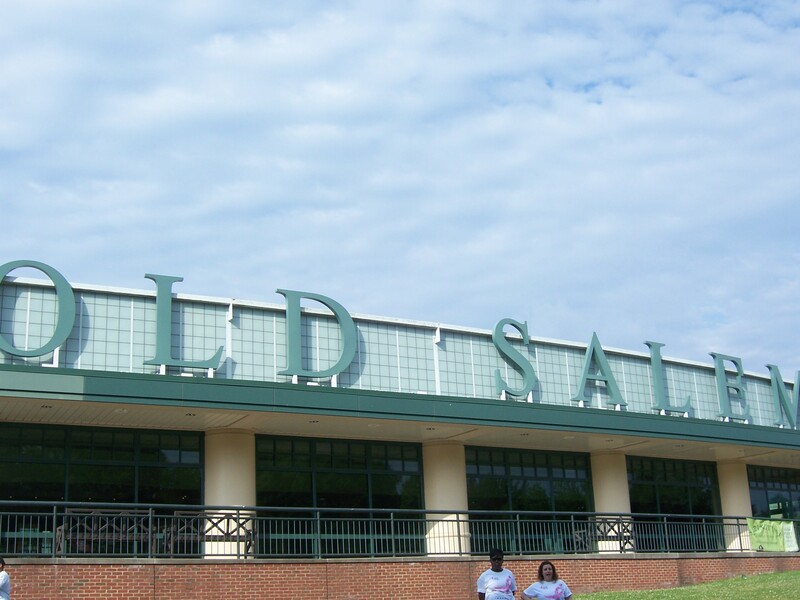 It also reminded me it’s been years since I’ve been to Old Salem.. I need to go back.